Where’s the Terminator when you really need him? This is Sandra Tsing Loh with the Loh Down on Science, and an ecosystem under attack. Australia’s Great Barrier Reef is truly a wonder of the natural world. But it faces a dangerous interloper: The Crown of Thorns starfish, or “COT” for short. These have spiky arms, hence the name. COTs eat coral and have few natural predators. When reefs are healthy, they can recover from the predation. But when reefs are stressed, COTs can get the upper . . . arm. Experts estimate they’re responsible for forty percent of the Great Barrier Reef’s decline! Scuba divers can kill COTs. But there aren’t enough divers for the job. It has onboard cameras, a computer, and a navigation system. 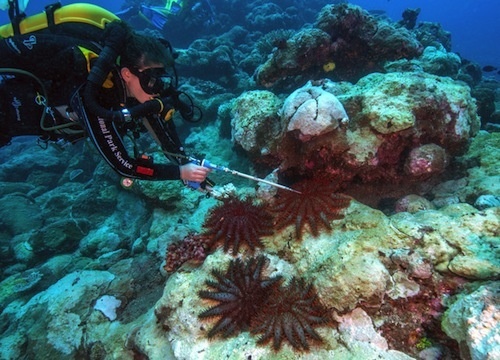 Its software uses photographs to train it to identify the starfish. Once it does, Cotsbot’s pneumatic arm injects the COT with deadly bile salts. Then it’s Hasta la vista, starfish! The team hopes to deploy a fleet of Cotsbots, constantly hunting the starfish. And if they miss a spot? They’ll be baaack!